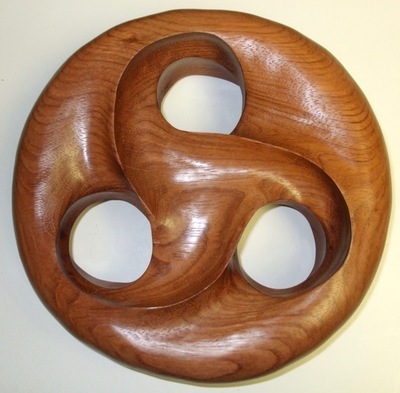 The Brazilian Cherry wood carving was made from a block of size 3"x10"x10" and the completed piece is 9.5" in diameter and 2.75" deep. This carving was inspired by a design of an artist from Shapeways. During the carving process the curves going through the three holes were made more shallow, so they ended up forming a single long curve that passed through each hole twice (once going up and once going down).